I wrote this page to make network wiring easier by putting the basic information together in one place. This was after I dug up the pieces individually in order to wire my house. For more detail, a few relevant books are listed near the end. If you just need pinouts, they're in a special section. CAT5 wiring will happily work at either 10Mb or 100Mb, with just about any machine; so you can run a slow net now, and upgrade later without rewiring. One snag is that your network must be arranged in a "star". That is, every device must have a separate wire back to a central point, where a device called a "hub" passes data from one wire to another (fortunately, a fine hub is available for under $50). You cannot just bring the wires from multiple devices together and have it work – unless you have only two devices total, and a special cable (see below). This page, all by itself, should give you enough basic information to get going. However, don't try this if you're not fairly mechanical, or adept at similar tasks. CAT5 wiring is touchy, and it's easy to make bad connections (or worse, wiring that almost or usually works, but fails under stress such as high data rates). Diagnosing such problems can be hard, even with expensive test equipment. Also, although I've tried hard to get this all right, it is entirely possible I've made mistakes here, or that your circumstances may require special materials or procedures beyond the simple cases I describe. Again, I can't predict or evaluate that, and it is your responsibility to ensure that any work you do is safe and legal. I am not a professional sysadmin, electrician, network-builder, etc. ; I do software, markup language standards (like XML), linguistics, and other things involving bits rather than volts. This page is here to be helpful, but you use it at your own risk. For big projects, you may want a CAT5 "patch panel" at the hub end where all your wires come together. I wouldn't bother, since (a) wiring a plug is no harder than wiring a panel; (b) you still need cables to go from the panel to the hub; and © it adds extra connections, so lowers reliability. If you do want to do it this way, you'll need a few extra tools and techniques I'm not going into here, other than brief mention under pinouts. One case where a patch panel might be useful is if you want to share a wire for phone and net: you can run the wires between two blocks mounted side by side, and punch down the network pairs to one block, and the phone pairs to the other. But see Relation to phone wiring. For more details, see below. Generally you want 4-pair, 24AWG solid-wire cable rated for at least 100 MHz: make sure it says CAT5 (see labeling). If it doesn't say it, it probably isn't. Don't mess with CAT3; you can probably run a 10MB net on it, but you'll just do it all over in a couple years. It doesn't cost much more to get wire rated for 300 MHz instead of 100, which may work for longer into the future. Cable comes shielded and unshielded; unshielded (see picture) should be fine for most applications, but if you're running near other wires a lot, or have big magnets around your house, go for shielded. You can get sockets in a variety of forms (much like phone sockets), even at Radio Shack and Home Depot. Surface-mount blocks cost about $6. If you're using in-wall boxes, you can get CAT5 sockets on whole wall plates for maybe $4. But I prefer the modular or "keystone" plates and inserts (see picture): you can use them for CAT5, phone, video, audio, etc. at the same time. Modular plates are about $1.50 and you can get them with 1, 2, 3, 4, or 6 holes (also double-width plates with 12 holes). A wide variety of inserts are available: CAT5 inserts are about $4.50 (see picture); phone ones $3.75, and so on. Get plates with more holes than you need now, and buy a lot of extra blank inserts ($0.20 or so). You'll need the blanks to fill extra holes until you need them; but just as important, you can drill holes in the blanks and mount other connecters in there. For example, behind my stereo I have a plate with phone, video, and speaker connecters; I made the speaker ones by screwing off-the-shelf binding posts into blank inserts. These look just like phone plugs, only wider (see picture). "AMP" brand ones need different crimping tools; make sure you get the right tool for whatever plugs you get. Some manufacturers also make slightly different plugs for solid vs. stranded wire, and for shielded vs. unshielded. As far as I can tell, they all work fine. Plugs are cheap, about $0.40. I have no relationship to these companies, except as a satisfied customer. Altex Electronics. 11342 IH-35 North, San Antonio TX 78233-5792. Phone 800-531-5369. Carries a huge selection of cable and parts, and some tools, with excellent prices and service. Jensen Tools. 7815 S. 46th St., Phoenix AZ 85044-5399. Phone 800-426-1194. Carries individual tools and well-organized kits, plus some materials. Ask for their "Communications Products Resource Guide". Install sockets at the device ends (typically wall-plates all over). Don't strip the wires. Remove only as much outer cover as you need to do the connections (see picture). If you're new to this, practice on scrap cable until you can cut the outer insulation without nicking the inner insulation. The best bet is to cut only partway through, and pull to snap the last little layer. Next, sort the wire ends into the right order for the socket. Untwist each pair just enough to get the wire ends all even, and never over 1/2 inch. Then trim the ends to be of the same length. Don't let copper hang beyond the ends, it can easily bend a little and short out the cable. Then put each wire into the right slot on the socket and push it down (see picture). You can try to get them all lined up and then squeeze down the cover; I find it easier to punch each wire into its slot with a fingernail, so they hold better even before the cover secures them the rest of the way. Double-check which wire is which. Plugs are a little touchier. Remove the outer cover about 1/2 inch. Adjust the length so there will be intact outer insulation under the strain relief once the wires are seated. The strain relief is a bit of plastic near the back of the plug that gets crimped down at the same time as the connector pins do (practice on scrap the first time). After removing the outer cover, sort the wire ends into the right order for the plug. Untwist each pair just enough to get the wire ends all even, and never over 1/2 inch. One trick is to strip a little more than you need, sort the wires into the right order, then trim them off evenly to the right length. Don't let copper hang beyond the ends. Right after trimming, use one hand to hold them straight, check the color order again, and use the other hand to slip the plug on. Look into the plug (normally transparent plastic), check that the wires are seated under the connector pins, and then put the crimp tool on and squeeze. The most common error at this point is probably putting the plug on upside down, which will swap the wire order and not work. See the picture (shown with more stripped than you want, so you can see the colors). CAT5 connectors look just like telephone connectors, only slightly wider, to allow 8 wires instead of 6. You can physically plug a 6-pin plug into an 8-pin socket, but it may damage pins 1 and 8 of the socket. Ethernet only uses 4 wires, but running 8 will save enormous time the first time a wire fails: you can just switch to another pair. Also, if no wires break you can split out the 8 into two sets of 4, and put 2 devices at the end of any wire (there are even handy adapters for this, like a one-to-two phone line adaptor; sadly they're not easy to find, but you can make one with a plug and two sockets). Or you may be able to use the other pairs for phone lines. However, I gather that the formal CAT5 definition reserves the remaining wires, so this is technically not allowed. See Relation to phone wiring, below. Or, in prose (and for accessibility), from pin 1 to 8 we have green/white, green, orange/white, blue, blue/white, orange, brown/white, brown. See also the wires in an actual plug. 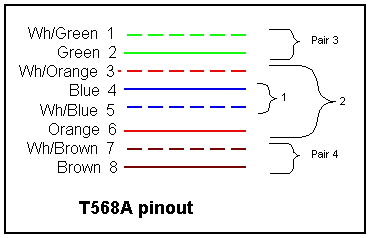 Only pair 3 (green, on pins 1 and 2), and pair 2 (orange, on pins 3 and 6) are actually used. So you can botch the other pairs and not get in trouble… until you want to use the other pairs to add a device without having to pull more wires through walls. Old 10-base-t Ethernet specs called these pairs 1 and 2, on the apparent expectation that you wouldn't have any other pairs around. But pair 1 in CAT5 is the blue pair in the center, which is not used – this is the same color and pins as for the primary telephone line wires, so avoiding it has the advantage of making it less likely that a telephone pair will get patched to an Ethernet pair (where the ringer voltage would probably cause lots of trouble). CAT5 signals are "balanced": the striped and solid wires in a pair carry the same information negated, so their magnetic fields tend to cancel. Unlike phone wires, CAT5 wires do not cross over; the same wires go to the same pin numbers at all connectors. This works because hubs all have internal crossovers. 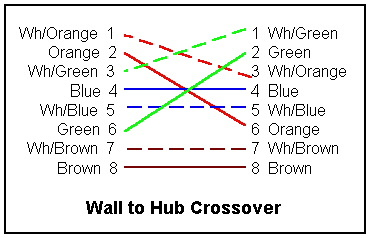 Hub-to-hub interconnects need a special crossover cable, as does a hub-to-DSL-router connection, or a 2-node hubless network. See below for the details of making a crossover cable; if you make one, mark it so clearly that you'll never confuse it. I'm right at the length limit for DSL, so had to learn a few tricks. For example, the provider's measurement of your distance out will likely be about 2000 feet too high – merely plugging in the DSL modem may knock 2000 feet off the measurement (thus, perhaps, bringing you in range). Also, every splice in the line degrades the line – especially things like wire nuts. It may help to install the DSL modem right where the line enters the house (in which case, be sure you've run a CAT5 line from there to your hub). My line was unreliable until they came in and removed 2 gratuitous splices. Or, you can get a small routing box that you hook up as if it were a full-fledged machine. It takes the one IP address you have, and forwards messages back and forth between your other machines and the net. It will probably support DHCP on your side, so any machine you plug into your net gets assigned an IP address automatically (such addresses come from a reserved range that is just for internal networks – so routers won't generally pass them through, and your internal traffic shouldn't be visible to your provider). The box then uses "IP masquerading" to rewrite requests from your machines and forward them onto the Internet as if they were its own (and of course to forward the replies back the other way). One such router I've heard good things about is the Linksys Group Broadband EtherFast Cable DSL Router. It goes for about $170, and nicely includes a 4-port 100Mbps Ethernet hub – which would cost almost as much anyway. This seems like a really smart investment.